Epidemiology and Presentation. AIDS-related NHL occurs in up to 19% of HIV-positive patients and is the second most common malignancy to develop in this population. Patients are much more likely to come to medical attention with advanced disease, systemic symptoms (fever, chills, night sweats, and/or weight loss), and extranodal disease, including bone marrow involvement, compared with their immunocompetent counterparts. In fact, 70% to 80% of AIDS-related NHLs are diagnosed with initial stage III or IV disease; this is in stark contrast to only 10% to 15% of high-grade NHLs in the HIV-negative population. Although most NHLs develop in the setting of advanced immune suppression, the disease may also occur in the setting of relative immune competence and thus cannot be ruled out based on a high CD4 count or low viral load. 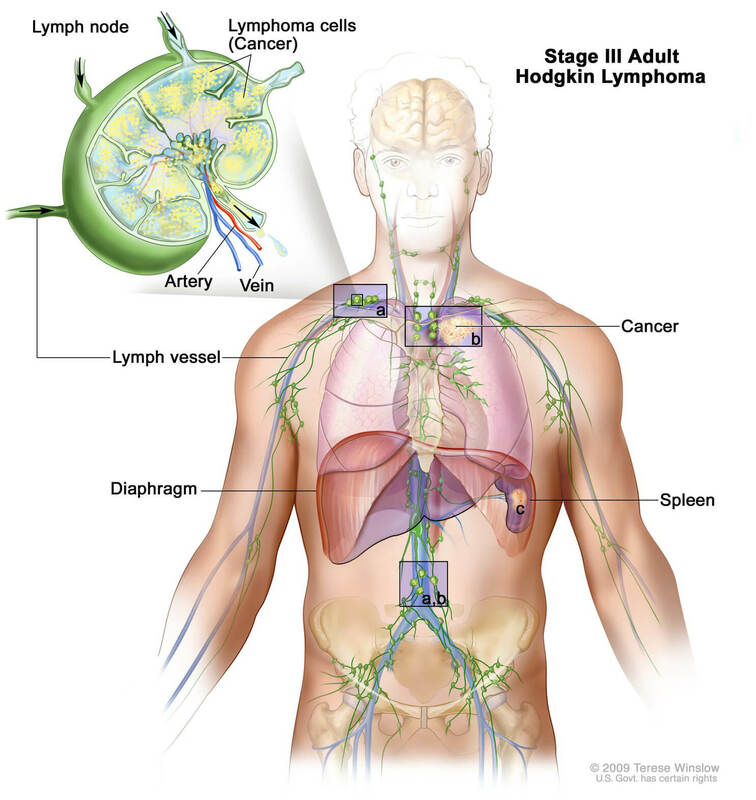 Burkitt lymphoma in particular has been noted to occur in patients with a relatively high CD4 count. Although the incidence of KS has declined precipitously since the advent of HAART, the effect of HAART on the incidence of AIDSrelated NHL has been more modest but is still significant. As with immunocompetent patients with NHL, AIDS-related NHL most commonly occurs in the head and neck, and nearly two thirds of patients have head and neck manifestations. Extranodal disease is twice as common in AIDS-related NHL compared with non–HIV-associated NHL. Extranodal head and neck sites include the oral cavity, sinonasal region, pharynx, nasopharynx, orbit, parotid gland, larynx, mandible, and central nervous system (CNS). Other sites of extranodal disease include the GI tract, bone marrow, and liver. Nodal disease predominates in the neck with frequent involvement of the submandibular, jugulodigastric, and supraclavicular regions. NHL of the head and neck often presents as a growing mass. Constitutional symptoms are frequently present, and fever, night sweats, and unintentional weight loss (>10% of body mass) are seen in 82% of patients. Initial symptoms are dependent upon the location of disease. Sinonasal lymphoma usually presents with nasal obstruction or other nonspecific symptoms consistent with chronic rhinosinusitis. NHL of the oral cavity most commonly affects the gingiva and palate and may manifest as a persistent sore, an enlarging mass, or loose teeth. Hoarseness, respiratory symptoms, and dysphagia may indicate laryngeal or pharyngeal disease. Nasopharyngeal lymphoma may present with nasal obstruction and serous otitis media. Because of the close association with HIV, patients newly diagnosed with NHL should be screened for HIV infection. Plasmablastic lymphoma (PBL) is a rare type of diffuse large B-cell lymphoma that typically involves the oral cavity and mandible but has been reported in other regions, including the paranasal sinuses, parotid, larynx, skin, and lymph nodes. Although most cases occur as AIDS-related NHL, there are reports of PBL occurring in TRs and in immunocompetent patients. The gingiva and hard palate mucosa are most commonly involved, and tumors have a propensity for adjacent bone invasion. These lesions must be distinguished from benign gingival enlargements, such as pyogenic granuloma and peripheral giant cell granuloma. A possible role of HHV8 in oncogenesis was previously proposed, but the current body of evidence suggests that the presence of HHV8 rules against PBL; in contrast, evidence supports a possible association with EBV. The diagnosis of PBL portends a poor prognosis regardless of treatment modality. pharynx, nasopharynx, orbit, parotid gland, larynx, mandible, and central nervous system (CNS). Other sites of extranodal disease include the GI tract, bone marrow, and liver. Nodal disease predominates in the neck with frequent involvement of the submandibular, jugulodigastric, and supraclavicular regions.